Voice of the Collector: As a collector, what has been you "best" pull? 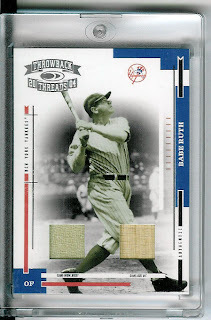 Oddly enough, my greatest pull was a Ruth Relic...my 2007 Goudey Immortals G/U jersey. But, man, this bat card blows that out of the water! This is outstanding! I once felt the same way about a cyan printing plate of Ryan Zimmerman from 2007 Moments & Milestones. It quickly passed, when I found out that I was the only one impressed by it. It was my first pull of any significance. I pulled a Johnny Podres auto from a 2006 Topps rack pack at Target. Not thrilling to some, but as a Brooklyn and L.A. Dodgers fan, I nearly fell over. I didn't know you could find autos in rack packs. I've been buying them on the cheap to finish my 06 and 07 base sets, never realizing there even could be anything but base in there. To answer the original question ... I think my first "hit" was coolest. Wasn't even anything special. It was a Paul Molitor GU from 07 Legendary Cuts. But just the idea that a jersey could be in a card was awesome enough for me. Since I don't buy much high-end stuff, it's been pretty much the garden variety common GU/AU for me. The best pull I've made came a couple of months ago - UD Baseball Heroes had just come out, and I went to buy a couple packs in hope of pulling the Jeter. I never did pull a Jeter, but I did pull an autographed red parallel 10/10 Cal Ripken Jr. Not too bad, although I'm still waiting to pull that damn Jeter. Got one of the red ink autos of Bill Mazeroski from '08 Heritage. Don't get much wax, and no high end, but that was pretty nice. The two coolest (for me anyway) came from a hobby box of 2007 Upper Deck series 2. Both relic hits were of White Sox players. Jim Thome and Bobby Jenks. I nearly fell out of my chair when I pulled the second White Sox relic from the box.